Sydney Dance Company has started its 50th anniversary year with an exciting triple bill called Bonachela/Nankivell/Lane under the umbrella title of Season One. It features brand new works by Artistic Director Rafael Bonachela, who is celebrating his own 10th anniversary with the company, and Gabrielle Nankivell (Wildebeest), together with the mainstage debut of Melanie Lane’s WOOF, which was a hit at SDC’s 2017 choreographic development program New Breed. The three works each run around 25 minutes, and are performed without a set. Instead, dynamic lighting shapes the space and sculpts the exceptional dancing. Blackouts also punctuate each piece, but beyond that they are satisfyingly different creations. The evening ends in electrifying fashion with WOOF, which was clearly the crowd-pleasing highlight on opening night. It begins with a low hum, which we soon realise is coming from the 12 dancers as they process on stage and form a stylised tableau. In silence now, they hold the pose, then move slowly to another position and recline into a different tableau, and then another. With the dancers dressed in various golden and flesh coloured costumes, designed by Aleisa Jelbart, the effect is like a Renaissance painting combined with a quirky fashion shoot. In an intriguing touch, the dancers’ hands and forearms are covered in a sooty black powder. Then the music composed by Clark cuts in, a dissonant, classical cello at first, that gradually warps into a pulsing electronic beat. The dancers form into different groups, and the vibe morphs from art installation to contemporary nightclub, with a futuristic, sci-fi bent. Lane’s fabulously detailed choreography is constantly surprising, as groups form, shift and reform. A girl is held upside down, the dancers move on perky tip toe, their bodies shake and judder, heads flick from side to side, hands push on throats, shoulders leap, hips wiggle. As the dancers gather to form a pulsing mass, their clothes, faces and limbs gradually become marked with the black from their hands. The lighting by Verity Hampson is wondrous, and a key element in Lane’s final, transcendent image which suggests another world beyond. WOOF is a stunning, wildly inventive work, that flashes past so quickly you feel it has ended all too soon. The evening begins with Nankivell’s Neon Aether, choreographed to a score by her partner Luke Smiles. (Clark, incidentally, is Lane’s partner). Performed by eight dancers, Nankivell plays with the idea of air, the vastness of space, and the need to connect with the universe around us. At one point air suddenly seems to become water, as the dancers’ limbs seem buoyed by a different element. Smiles’ score brings together the sounds of crackling radios, sealed doors, oxygen masks and a countdown as astronauts prepare to go into space, along with rushing sounds, beeps, clanks and other industrial noises. A woman in red (Ariella Casu) stands to one side watching as the dancers move from solos to duets and groups. Towards the end, she performs a stunning solo of her own. Nankivell uses lovely, sweeping, eloquent gestures as the dancers stretch and reach out; at other times bodies and heads flicker and shake. Harriet Oxley has dressed the dancers in stylised boiler suits, which have flimsy sections of fabric to give them a lighter, more graceful look. Designed in different hues, Oxley uses the colourful palette to evoke the horizon, atmosphere and planets. Damien Cooper’s lighting also uses different shades, as well as snap blackouts during which the space elements in Smiles’s score resonate. 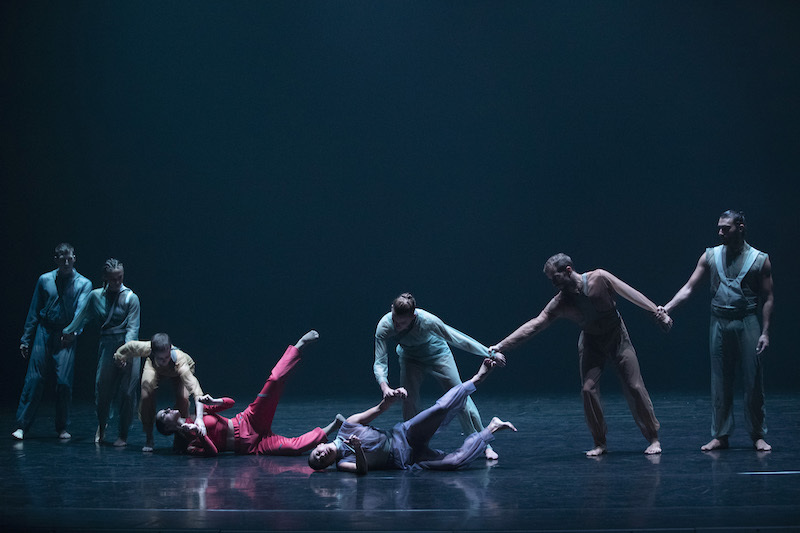 Bonachela, who often references numbers when structuring his work, has called his new piece Cinco (which means five in his native Spanish) – a reference to Sydney Dance Company’s five decades. He uses a quintet of dancers who perform to Alberto Ginastera’s String Quartet No 2 Op. 26, a five-movement score which ranges from pensive to fiercely urgent. Playing with the idea of the pentagon and repeating various patterns, Bonachela has the dancers move at a ferocious speed as they swoop, swirl and leap. Dressed in lovely, simple costumes by Bianca Spender with floaty skirts for the women, it frequently feels as if the dancers have united to become an organic whole. At other times they soar through the air like a group of fireflies. At one point, the stage looks like shining water as Damien Cooper’s imaginative lighting makes it glisten and reflect the dancers’ bodies. Cooper also references the number five, with five spotlights hanging over the stage. He also uses dramatic shards of light from the two sides of the stage. Cinco unfurls at a relentless pace. A few slower moments might allow you to take your breath but it is still a very beautiful work. There are several new dancers in the line-up but the signature SDC style that Bonachela has developed remains and the dancing is as dazzling as ever. It does a lot with very little, but this stripped-back touring production doesn’t always transmit the power of Shakespeare’s play. There is much to savour in this new dance theatre work, but it needs a clearer, stronger focus. The hit rom-com double is back and it's as sweetly charming as ever. This restaged Gothic murder ballad thrills with its grisly poetry and razor-sharp production.